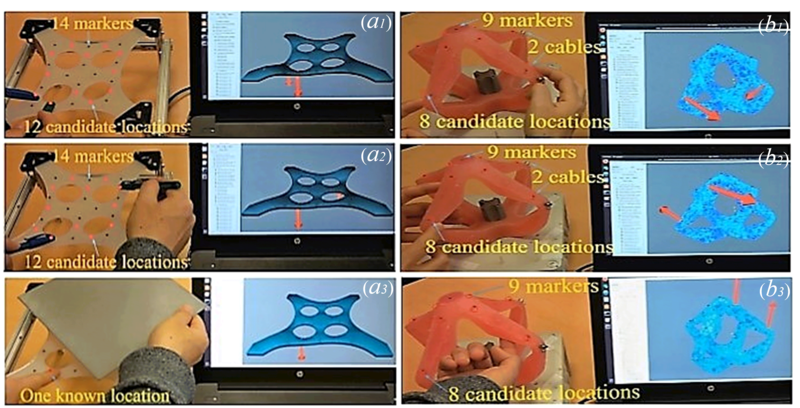 In this paper, we propose a new framework of external force sensing for soft robots based on the fusion of vision-based measurements and Finite Element Model (FEM) techniques. A precise mechanical model of the robot is built using real-time FEM to describe the relationship between the external forces acting on the robot and the displacement of predefined feature points. The position of these feature points on the real robot is measured using a vision system and is compared with the equivalent feature points in the finite element model. Using the compared displacement, the intensities of the external forces are computed by solving an inverse problem. Based on the developed FEM equations, we show that not only the intensities but also the locations of the external forces can be estimated. A strategy is proposed to find the correct locations of external forces among several possible ones. The method is verified and validated using both simulation and experiments on a soft sheet and a parallel soft robot (both of them have non-trivial shapes). The good results obtained from the experimental study demonstrate the capability of our approach.